Where are we now with the devices that not only take up a substantial portion of the waking lives of many of us, but even threaten to make laptop computers obsolete for astronomy? Astronomy apps for smart devices are mature, have plenty of features, and those features are highly competitive with similar laptop/PC applications. That is not what has changed most, however. What has really changed is that apps are big now. Astronomy apps are increasingly displayed on devices with screens large enough to make them truly useful. I’ve been using smart devices and their predecessors, the PDAs (Palm Pilots, that is), for over fifteen years, but it has taken this transition to larger displays to make them really important to me for use in our avocation. 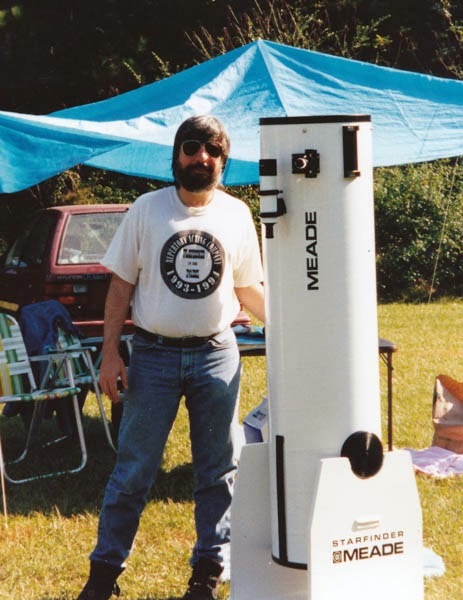 Sure, it was fun beaming Palm Pilot observing lists back and forth with my friend Tom Wideman on the 2001 Texas Star Party observing field, but PDA astronomy was really just fun. A Palm was not indispensible to me as a laptop had become. That didn’t change till just the other day. It began while I was packing for the Peach State Star Gaze. I was finishing loading Miss Van Pelt, my Toyota 4Runner, when my iPhone 4s rang. I fished it out of my pocket to answer while juggling an equipment case in my other hand, fumbled, and dropped the phone to the concrete floor of the carport. Uh-oh. Cut to the Deerlick Astronomy Village a day or two later. Phone service was spotty, but I was able to get wi-fi, and thought I’d have a look at the weather predictions for Friday night. Reached in my pocket and grabbed the phone. Felt kinda funny. Pulled it out and examined it. Yes, the screen was fine, but the phone’s back was a mass of cracks. It’s made of a glass-like composite of some sort similar to the screen, and looked like it would soon be falling to pieces and cutting a hole in my leg if I put it back in my pocket. It was clear I needed a new phone. The question was which? I’ve been impressed by the Android Phones, particularly the Samsung Galaxy, but my inclination was to stick with the iPhone, which I’ve been using for years. I was keeping an open mind, though; I’d look at the Galaxy in the store, the ATT store, and maybe some others—LGs in particular. Heck, I’d even consider a Galaxy Note. A Galaxy Note? That enormous mashup of smart phone and tablet? Yep. I knew the reason why I wasn’t using my smart phone more for astronomy: the screen. Wasn’t just my aging eyes, either. The minuscule display of the 4s wasn’t large enough to make star charting apps very practical for use at the scope even for somebody with 20-20 peepers. I wanted big, and I believed that meant the iPhone 6s Plus or the slightly larger Galaxy Note. That’s what I thought until I walked into the store, marched up to the counter, and told the nice and helpful AT&T guys (alas, that cute Lily from the TV commercials was nowhere in sight) I was thinking about was the 6s Plus. They said they could do that, but that if I, like most dudes, carried my phone in a pocket of my jeans, I really ought to try pocketing a 6s Plus before settling on one. I picked one up and tried to stick it in my pocket experimentally. No way; just much too big to carry that way. I don’t like belt cases and am too old-fashioned to start carrying a men’s’ shoulder bag, so the Plus and the Note were clearly out. I was disappointed, and the AT&T salespeople could see that. They said they had a way to assuage my disappointment, though. They offered me a good compromise. An excellent deal on an iPhone 6s (no Plus) with 64 gigs AND an Asus 7-inch tablet with Wi-Fi plus cell-tower capability. The 6s is not as big as a plus, but was much bigger than my 4s, and the tablet was even bigger than the 6s Plus. I was sold. Denouement? The phone is great. It is large enough that I can do many things, including many astronomy things, on it happily. But it is the tablet that has rung my chimes. The Android operating system’s way of doing things was not that difficult for me to learn. It’s different from iOS, but not that different, and I was soon looking at FaceBook and downloading my first Android app from the Google Play Store, SkySafari Plus. There is no doubt SkySafari is and will likely remain the premier planetarium program for smart devices for the foreseeable future. It was out of the gate early, and its developers have continued to improve it steadily. Newcomers like the Bisques’ TheSky for iOS (specifically designed for the iPad) may gain ground as they mature, but for now SkySafari is it. I just didn’t realize how it it is till I used the program on the 7-inch Tablet. In the past. I’d used the basic version of the app on my 4s and my old iPod Touch occasionally. Usually as an aid to identifying stars in the gloaming. But use it to find objects or run a telescope? Nope. As above, just too small. That was obviously going to be different on the tablet. That in mind, I downloaded the middle version of the app, SkySafari 4 Plus. Its extremely reasonable price, $14.99, meant that if I didn’t use it that much, even on the tablet, I wouldn’t be out that much moola. With 2.6-million deep sky objects and 31,000 deep sky objects, it was at least obvious Plus would be way more powerful than the basic edition. I had that tablet loaded up with what was an attractive and legible and detailed planetarium program. Would it work for my visual observing? Yes it would. One night with the 10-inch and the star clusters of Cassiopeia showed that. What was it like using the tablet and SkySafari? It was sorta like using my old print fave, Sky & Telescope’s Pocket Sky Atlas. But better. Mucho better. I could zoom in as much as I needed. Search for objects easily. Get information about what I was searching for with a touch and a swipe. Finding DSOs with the scope? The fact that I could put a Telrad display on the screen made that duck soup. How was the display dark adaptation-wise? In night vision red it was just right for the backyard. I might want a red film filter over the screen at a dark site, though. We’ll see. Will I be ditching my laptop anytime soon, though? Probably not. Oh, I might if I could but I can’t yet, and likely neither will you. Unless you opt for a Windows capable tablet you are stuck for a couple of reasons. There is no way to control a DSLR or CCD with a tablet or phone without having a laptop in the mix, not yet, not that I am aware of. I have little doubt that will happen, but not yet. Also, as you know, I am a big fan user of planning programs for astronomy. While there are a couple of rudimentary apps of this type for smart devices, there’s no Deep Sky Planner or SkyTools, not yet. I’m sure there eventually will be, however, and am frankly astonished that a powerful one hasn’t appeared yet. As above, SkySafari is on the top of the heap when it comes to planetarium programs for phones and tablets. It even has some (fairly rudimentary) list making tools. It is beautiful and it is detailed. If you don’t want to settle for the couple of million stars and thirty thousand DSOs of Plus, you can up the ante with the Pro version ($39.95), which boasts 27 million stars and over a million faint fuzzies. Believe me, this thing gives up nothing to PC planetariums. One thing that gave me pause when I was preparing to buy the Android version was that I’d heard its performance is not quite as good on that platform as on iOS. It is even stated on the maker’s (Curriculum Simulations) website that the app may run slower on Android devices than on iOS ones. That may be, but the program runs incredibly well on my humble Asus tablet; I don’t notice any performance difference between Plus on my Android widget and the basic version on the iPhone. One other concern some may have regarding the Android version is that you cannot utilize Sky-Fi, the Wi-Fi system sold by Curriculum Simulations for wireless control of scopes with SkySafari. Unless you “root” (jail-break) your phone, you are out of luck. Android devices do not normally support ad-hoc Wi-Fi networks. The only other out is carrying a Wi-Fi router to the observing field with you, and who wants to do that? Luckily there is a non-Wi-Fi alternative for wireless scope control, the company’s new SkyBT, which allows you to wirelessly control the scope via Bluetooth widget. Not only does it, I understand, work well and reliably, it is slightly cheaper than the SkyFi system at $99.95 versus $109.95. I haven’t thought much about doing this yet, since I am going through an astrophotography phase and need a laptop in the field, but I might someday. Everybody needs to keep up on what’s going on with the sky week-in, week-out. You can do that with various websites, but why not make it easy on yourself? This little app from Sky & Telescope is updated weekly and keeps you apprised of and alerted to sky happenings (the Plus version can sync with your device’s calendar). Not only do you get a listing of interesting events, clicking on them will bring up a little built-in planetarium app (based on SkySafari). Yes, if you are a SkySafari user the basic version of SkyWeek is built-in to that app, but I find it handy to have the standalone version, too. It’s certainly cheap enough to allow even stingy me to do that. The basic SkyWeek is free and the Plus variant is a mere $2.99 (iOS or Android). Even before I got my large-screen smart thingies, I did use my devices in astronomy rather frequently for one thing, checking the weather, the weather as it pertains to observing. Will it be cloudy or clear? How about the transparency? Seeing? Normally I use the apps below for that, but I’ve recently found a rather nice webpage on the Accuweather site, “Accuweather Astronomy.” It provide stuff like Moon phase and rise/set info, but also, most interestingly, boils down the weather forecast for your current location into “poor/fair/good/very good/excellent for stargazing.” I find its predictions to be quite accurate much of the time. A step up from Accuweather is a nice app that also condenses the forecast into “good/bad for observing,” but in a somewhat easier to use fashion. No messing with your browser, just click an icon. I like ScopeNights and have been using it since someone turned me onto it at a star party a couple of years ago. Only thing I don’t like about it? It is iOS only. How accurate is it? As accurate as anything else. Like every other weather app, whether for astronomy or not, there are misses as well as hits. These apps display the famous astronomy conditions predictor Clear Sky Charts (nee Clear Sky Clock). Both are much the same in that you can save your favorite sites and get the CSC graphic display of predicted conditions for them for the night. MyCSC is a little prettier than Clear Sky Droid, but in the end they do exactly the same thing, display that CSC bar graph. I prefer Clear Sky Droid, but only because of the larger display of my tablet. Is CSC more accurate for astronomy than other weather sources? Sometimes yes, sometimes no. Like ScopeNights and Accuweather, there are times when it is on the money and other times when it is dismally wrong, but that is the nature of weather prognostication. There is one other weather app (for Android) that I like and which seems to have a lot of promise, Astro Panel, which uses the 7Timer service for weather data and tailors that to astronomy. When it works. Which is seldom. I usually only get “Sorry, problem connecting to 7timer service.” I’m hoping this one will get fixed out one of these days. What else? I have some more interesting apps lined up for you, including one that, if I get it working might be very, very interesting, Universe2Go. Let us leave all that for next week or possibly the week after, though. Right now, I hope to get out and do something I haven’t done in months, actually observe the deep sky from my club dark site and report on that. If you are a Facebook friend of mine, this won't surprise you because you probably noticed I recently posted that I was selling my time-honored 12-inch truss tube Dobsonian, Old Betsy. Why in the name of all that is holy would I do something like that? If there’s any telescope that I’ve been identified with over the years other than C8s, it has been that stalwart old Newtonian. The basic reason was simple. She just wasn’t being used. The last time the scope cruised the night sky was at the 2014 Deep South Regional Star Gaze, and after my acquisition of a 10-inch solid tube Dob, Zelda, the chances of me getting Bets under the stars anytime soon seemed remote. The 10-inch has a good mirror and is much quicker and easier to get going in the backyard. Another reason for saying “sayonara” was that I am at a time in my life when I don’t want to feel encumbered, tied down by things, big things, I don’t need and don’t use. So Betsy had to find a new home. While I did mention the telescope’s availability on the FB Newsfeed, I really wanted to sell her locally and never got as far as posting an ad on AstroMart. Frankly, I let her go for a very modest sum, but that made sense. I would not have dared to try to ship her. She’d have to be “pickup only,” or I might, I thought, deliver her within a reasonable 300 – 350-mile radius. While I probably could have gotten some bites on that, I would have had to spend gas money on a delivery, and at the extreme end of that range I’d probably have wanted to stay the night in a motel before returning home. So, I let her go for less than I maybe should have, but I believe she has gone to someone who will use and respect her, and I certainly got my money out of her over two decades of use and fun. I am so glad that the last time I used her was to revisit and complete the observing list I used with Betsy on her first star party outing in ‘94. I think that will provide a little closure for me. Was it easy to let go? No. I set her up in the backyard to demonstrate for the buyers, a young couple, and while waiting for them to arrive I turned Betsy to M15. The image in my 8mm Ethos was crazy-good and all the memories of all the nights Bets and I spent under the stars together came flooding back. I began to doubt whether I could let her leave. In the end, good sense prevailed. I have my memories, and Bets is better off being used and cared for. That is not the end of my selling either. If you know anyone who wants a high-toned standard C8, an RV-6, or a StarBlast, send them my way. For the reasons above, these scopes simply must go to new homes as well. But don’t be afraid. I am not shutting down my observing—not hardly. While a bunch of scopes will go before I am done, Betsy at least has been replaced by a new one that I think I will use a lot. What is that? All shall be revealed over the next couple of Sundays, friends. I have used SkySafari to control my mount since it came out. Another app that works very well plus has additional features like improving pointing is Astromist. Triatlas is a great chart app that is essentially Uranometria on a screen. I use an iPad mini now but I did use an iPod for a few years. More screen real estate helps but not absolutely necessary. Another weather app I really like is "Dark Sky"
It gives you an easy to follow hour by hour breakdown of upcoming weather conditions. It's not astronomy specific, but I find it as good as any. It's also somewhat crowdsourced and smart about predicting local weather.